I was about to head out for lunch the other day at work. I had a major meatball sandwich attack and was determined to satisfy the crave. 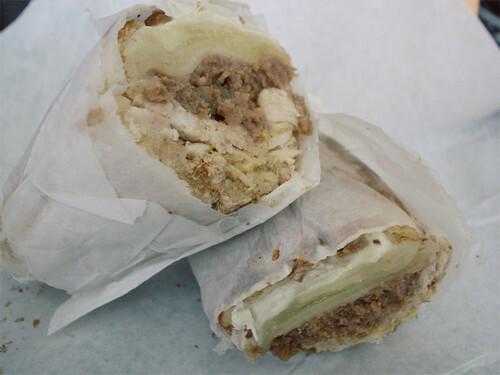 Then at the last moment I saw Mister Adam Kuban’s, from Serious Eats, tweet about getting lunch at No. 7 Sub at the Ace Hotel. I did a quick search for the menu and where Ace Hotel was exactly. Always imagined it to be somewhere in Midtown, glad I was wrong. Everything on the menu sounded so awesome. I got there around 1:45pm and no one was in line to order but there was a HUGE crowd all waiting for their sandwiches. 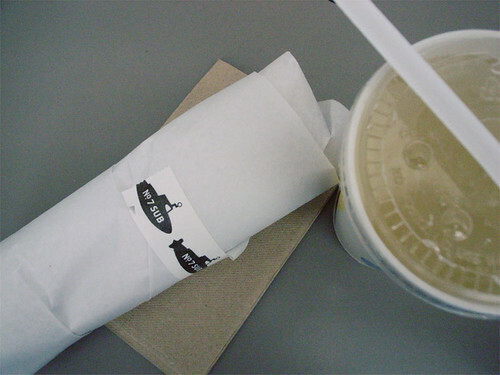 For $9, all sandwiches were $9, I got the turkey cubano and for $3 I got a small housemade yuzu soda. Then I stood in the back and waited…and waited…..and waited. I was number 145 and they were just calling out 129 when I got there. After 40mins of standing around I finally got my food and walked back to the office. I sat down and quickly unwrapped the sandwich. It’s a pretty good deal for $9 compare the crap you get at places like Europa. CRAP! I took a bite of the sandwich and totally had forgotten about the 40min wait I had to endure earlier. Stuffed with turkey meat, pickled daikon, Swiss cheese and Chinese mustard it was so good. The Chinese mustard gave it a wasabi sorta kick to the sandwich but felt the pickled daikon got a little lost in the sandwich. I was really enjoying the bread. I’m actually not a big fan of crusty bread so to have a soft bread it was nice.